Moscow, established in 1147, is today one of the world’s capitals of culture. The most popular sights of Moscow are the Kremlin, Red Square, St. Basil’s Cathedral, Ostankino Tower, Lenin’s Mausoleum, the Tretyakov Gallery; the list is virtually endless. In Moscow there are numerous world-renowned theatres and concert halls: the Bolshoi Theatre, the Stanislavsky and Nemirovich-Danchenko Moscow Music Theatre, the Moscow Art Theatre, the Taganka Theatre, and many others. 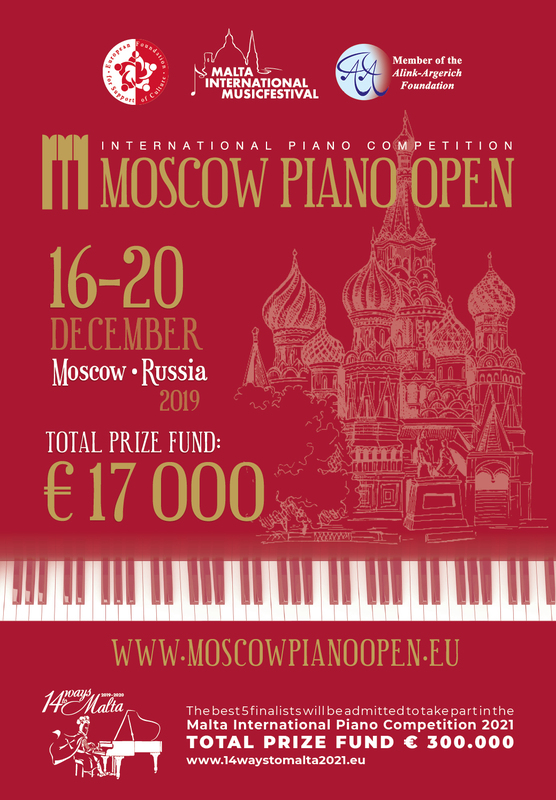 The Moscow Piano Open competition for young talented pianists will have two rounds at the Organ Hall of the Gnessin Musical College. The competition programme will include compulsory performance of Maltese composers’ music. At the end of the competition there will be a gala-concert of the winners and acclaimed classical musicians. The jury will consist of such renowned celebrities as the merited artist of Russia, director of the Gnessin Musical College Mikhail Khokhlov; the professor of chamber ensemble of the Moscow State Conservatory Alexander Bonduryansky; the professor of the Moscow State Conservatory Vladimir Ovchinnikov; the president and artistic director of the Talent Music Master Courses in Brescia, Italy, and the president of the Verona Music Festival Paolo Baglieri, and others. During the Festival, the most renowned music halls of Moscow will host a series of concerts with leading world pianists.